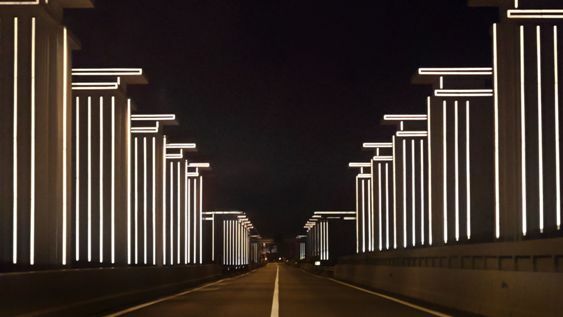 Now no more energy will be required by the street lights as new eco friendly and sustainable urban lighting design innovation program has been developed by the Dutch Based Studio Roosegaarde. The gates of this light are completely eco friendly and that’s why this project has been supported by Dutch government. It can cover the 32 kilometer stretch as well as in the dark drivers’ headlights. It can illuminate the structure by reflecting the light with the help of tiny prisms as they have been installed inside the structures. The gates of light have involved a full restoration of the dike fitting the structures along with a retro-reflective layer. It has been resulted in the lighting solution which requires no energy as well as creates no light pollution. It has been designed as an easy way to use nature as the source of inspiration for the energy as well as lighting solutions. It is inspired by the reflective qualities of the butterfly’s wings and the structures have been outlined with the small prisms which reflect light. This project aims to make all national roads energy neutral by 2030.The gates of light are the part of larger design innovation program.